Mastering the implementation and management of a Business Continuity Management System (BCMS) based on ISO 22301. This five-day intensive course enables the participants to develop the necessary expertise to support an organization in implementing and managing a Business Continuity Management System (BCMS) based on ISO 22301. The participants will also gain a thorough understanding of best practices used to implement Business Continuity processes from the ISO 22399. This training is consistent with the project management practices established in ISO 10006 (Quality Management Systems - Guidelines for Quality Management in Projects). This training is fully compatible with BS 25999 (Business Continuity Management Specification) and ISO 27031 (Guidelines for information and communication technology readiness for Business Continuity). 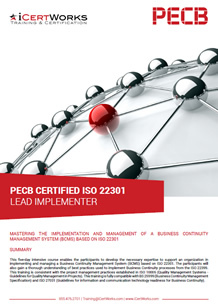 Contact us about ISO 22301 Lead Implementer Training!